Ocean County, N.J. Proscecutor Joseph D. Coronato, testifies before Congress. Dr. Bryce Pardo, Associate Policy Researcher at RAND, addresses the congressional panel. Dr. Daniel Ciccarone, M.D., Professor of Family and Community Medicine at the University of California, San Francisco, addressed the congressional panel. Ranking Democrat Rep. Karen Bass of Calif. US Rep. Dan Donovan (NY-11). Rep. Joaquin Castro of TX-20. US Rep. Thomas Suozzi NY-03. 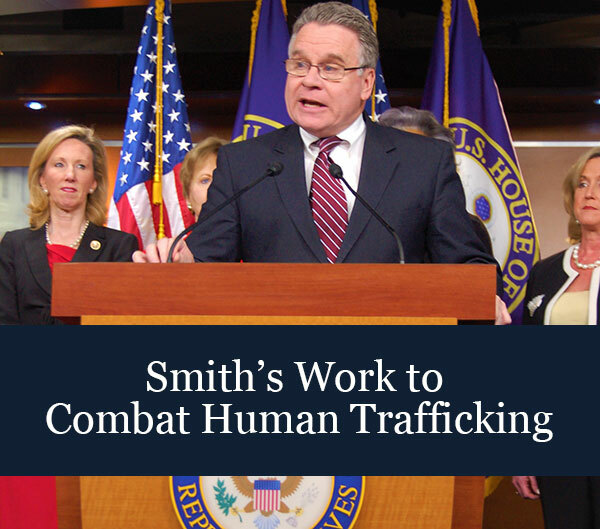 Chairman Smith opens the hearing on the deadly impact of Chinese exports of fentanyl to the U.S.
A leading prosecutor from Smith’s Congressional district, Joseph Coronato, of Ocean County, NJ, called China-made fentanyl into the U.S. a “synthetic storm” that is “devastating,” but highlighted his program that allows drug abusers to voluntarily turn themselves in to a police station—more than 800 since 2017—without being prosecuted. Smith said the program has “almost certainly reduced deaths.” In 2017, there was a 20 percent reduction in overdose deaths—174—in Ocean County, down from 217 deaths in 2016. Smith recognized Don Holman, who lost his son Garrett to an overdose of synthetic fentanyl that came directly from China. In written testimony, Mr. Holman reports that Garrett ordered it online; it was delivered in the mail without Garrett ever knowing of the poisonous effects fentanyl has. Last week, Smith spoke at the Mercer County International Overdose Awareness Day sponsored by Prosecutor Angelo Onofri and Robbinsville Mayor David Fried. Personal testimonies offered by survivors and recovering abusers were deeply moving. Trenton Police Chief Pedro Medina spoke of the loss of his son, Petey, but assured the audience that there is a “God who can help you.” Advocate Mark Manning, who lost his son Christopher, spoke of his ongoing pain at the loss of his son, while Adrienne Petta of Hamilton recounted the horrors of her addiction and the impact on her family. She mentioned her two children, who she said she put in second place compared to a bag of the drugs. Adrienne made it through, and is now a recovery specialist.